It has been specially designed for vehicles that travel off-road and at low speed (less than 80kmph). This sealant is suitable for vehicles used in public works, construction, industry, waste management, farming, forestry, landscaping and more... As well as on quad, ATV and motorbikes designed for Off-Road use. VIPSEAL Off-Road will protect you from punctures on tough, hostile terrain. 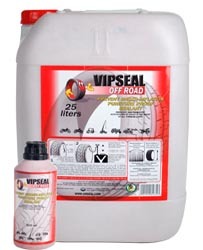 VIPSEAL Off-Road is available in 500ml bottle, 1l bottle and in 25l drum. On a 4x4 vehicle, if the owner use is driving off-road or rough terrain, the appropriate sealant is VIPSEAL Red. If you venture to do « On-Road », you should preferred VIPSEAL Blue. It is possible to drive with the minimum pressure recommended by the manufacturer. - Maintains air pressure (5 to 10 times longer) and increase the tyre’s lifespan (20% to 50%). -	Cuts repair costs and reduces impaired travel. -	Reduces dead time and loss of use. -	Protection against 100% of punctures from objects up to 12mm wide and reduces structural damage. -	Avoids disassembly and the need for an inner tube in a tubeless tyre. -	Contributes to sustainable development and environmental protection with a water-soluble, non-corrosive, non-inflammable, non-toxic, fibre-free sealant. -	Reliable for the entire lifespan of the tyre and rim, it protects them from bacteria, rust, corrosion, and mould. -	Water-washable, and withstands extreme temperatures from -35°C to +45°C, making it particularly suitable for driving in countries experiencing severe weather conditions. - VIPSEAL preventive action focuses on the tread area of the tyre but considering the filling volume it can protect of punctures in most cases on the side wall, with no guarantee provided. If having a cut or a puncture on the side-wall the tyre will have to be changed for security reasons. - VIPSEAL is a sealant for preventive punctures and is not a curative product. For injecting VIPSEAL with a 25l drum, depending on the pump: 1 pump action = 100ml or 250ml. If the tyre deflates after VIPSEAL is pumped inside, check to see if any objects are penetrating the tyre and remove them all. Re-inflate and rotate the wheel so that the sealant plugs up the hole(s). For frequently punctured vehicles or machinery, it may be necessary to periodically reapply VIPSEAL to guarantee ongoing effective protection. Keep out of reach of children. In case of contact with the eyes or mucous membranes, wash liberally with water. If ingested, call the nearest poison control centre.